It’s late – tomorrow actually. But I can’t go to bed without sharing some of my thoughts about this day. They’re kind of all jumbled up and may not make perfect sense to anyone but myself. But here they are anyway. I remember where I was; I remember how I found out. I remember how I felt because I still feel that way whenever I think about it. I remember feelings of immense sadness. I remember feelings of incredible love for my country. I remember having a new sense of pride when seeing our American Flag flying. I remember crying a lot. I remember the shock, the horror, the utter disbelief. I remember the stories of selfless sacrifice, brotherly love, and courage. I remember President George W. Bush’s words in the hours and days that followed. I remember being incredibly grateful for our military (still am). I remember wanting to watch the news coverage all the time, but couldn’t, because life still had to carry on. I remember praying for the firemen, policemen, our armed forces, the families who lost loved ones, etc. There is a place in Sandy, UT called the Healing Field. There are many, many Healing Fields in different cities in our country. It is an incredible place. 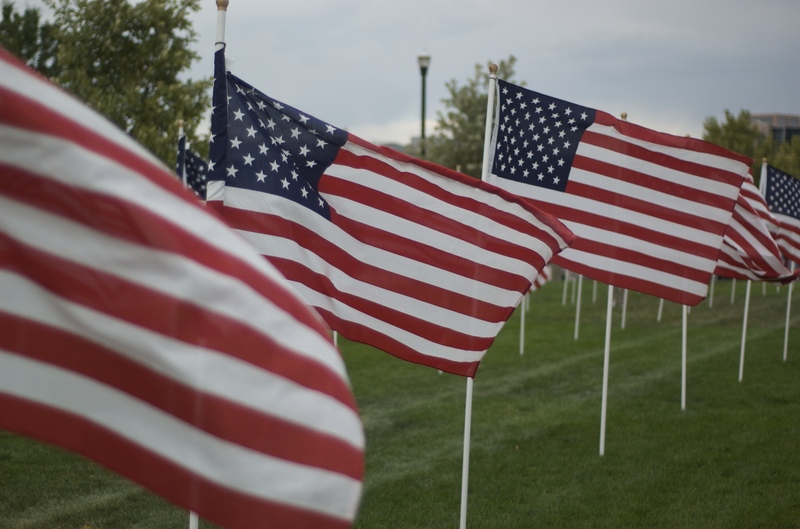 An American flag is placed for every person who died on 9/11, which means the ground is covered with flying flags. Click on the link because it will show you a panoramic view of what the Healing Field looks like. It’s pretty amazing. Have you ever been there? If not, you should go. If not this year, then next year for sure. The Healing Field flies the flags for a few days before, during, and after 9/11. It brings tears to my eyes every time I go. My husband and I take our children with us. I only had 2 children at the time; they were 5 and 2 years old. Grant remembers a little bit, but not much. He mostly remembers that he wanted to watch a movie but my husband and I wanted to watch the news. So we set up the old portable TV/VCR in his bedroom so he could watch his movie and we could watch the news. Back to the Healing Field. It is a solemn, reverent, respectful place. It is, to me, a place to honor and remember. It changed our country forever. How can we ever forget? We shouldn’t. We need to remember. And least that’s what I think. This entry was posted in Holidays and tagged 9/11, Healing Field, patriot day, remembering. Bookmark the permalink.